Adlai Ewing Stevenson II (February 5, 1900 – July 14, 1965) was an American statesman and politician. He was known for his intellectual demeanor and advocacy of liberal causes in the Democratic party. From young adulthood, Stevenson had an interest and passion for foreign affairs. A lawyer by trade, he served as principal counsel and special assistant to the secretary of the Navy. Later, as a staffer to the secretary of the state, Stevenson participated in planning for the formation of the United Nations. He served one term as governor of Illinois and lost, by landslides, in two races for president against Dwight D. Eisenhower in 1952 and 1956. He was ambassador to the United Nations from 1961 to 1965. At the close of his life, Stevenson was respected by people of all persuasions for his vision and thoughtful eloquence that could free others from narrow-mindedness, selfishness and ignorance. He stood firm in his desire to protect and spread peace, justice and the well-being of humanity. Stevenson was born in Los Angeles into a well-established political family of means. His grandfather Adlai E. Stevenson I, whom he was named for, had been vice president of the United States. His father, Lewis Green Stevenson, never held an elected office, but served as secretary of state of Illinois from 1914-1917 and was considered a strong contender for the Democratic vice-presidential nomination in 1928. His mother was Helen Davis Stevenson. Helen's grandfather founded the Bloomington, Illinois, newspaper, The Daily Pantagraph. The family ran the paper through out Stevenson’s life. Stevenson was raised with his older sister Elizabeth, in Libertyville, Illinois, now called Bloomington, Illinois. When Stevenson was a child, there was a tragic incident that haunted him for the rest of his life. While showing off with his brother's hunting rifle, he accidentally shot and killed a young playmate named Ruth Merwin. Stevenson rarely discussed the incident, but many have theorized that his dedication to causes may have been due to the terrible burden of guilt he carried. Stevenson left Bloomington after his junior year in high school. He received his diploma from University High School in Normal, Illinois, Bloomington's "twin city" just to the north. After high school, he attended preparatory school at the prestigious The Choate School, where he participated in sports, acting and journalism. Stevenson served as business manager of the school paper The News, and was elected editor-in-chief. In 1918, Stevenson enlisted in the U.S. Navy and served at the rank of seamen apprentice. Stevenson attended Princeton University and became managing editor of The Daily Princetonian and a member of the Quadrangle Club. He received a B.A. degree in 1922. Stevenson was a member of the Phi Delta Theta fraternity at Princeton. After Princeton, Stevenson was pressured by his father to attend Harvard Law School but failed several classes and withdrew. Stevenson returned to Bloomington and became a writer for the family newspaper, The Daily Pantagraph, which was founded by his maternal great grandfather, Jesse Fell. Stevenson became interested in law again a year or so after leaving Harvard following a conversation with Supreme Court Justice Oliver Wendell Holmes, Jr. He decided to finish his law degree at Northwestern University School of Law. Stevenson attended classes during the week and returned to Bloomington on the weekends to write for The Pantagraph. Stevenson received his law degree from Northwestern in 1926 and passed the Illinois State Bar examination that year. He obtained a position at Cutting, Moore & Sidley, an old and conservative Chicago law firm. During this time, he became a popular member of Chicago's social scene. Stevenson married Ellen Borden, a wealthy socialite, in 1928. The couple had three sons, Borden (1930), Adlai III (1932), and John Fell (1936). 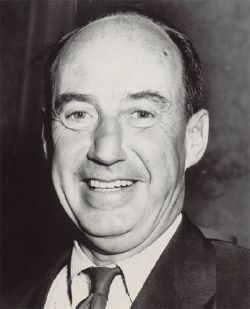 Adlai III eventually followed in his father's political footsteps, serving as Illinois’ U.S. senator from 1970 to 1981. In September 1949, during his term as governor of Illinois, Stevenson announced that he and Ellen were separating, and that he would not contest a divorce. The divorce was finalized before the end of that year. Stevenson dated various women during the rest of his life, including Washington Post publisher Katharine Graham. He was romantically involved with Marietta Tree, who was then the wife of multimillionaire Ronald Tree. Stevenson, however, never remarried. In July 1933, Stevenson was offered and accepted a position as special attorney and assistant to Jerome Frank, the general counsel of the Agricultural Adjustment Administration (AAA) a part of Roosevelt’s New Deal. Following the repeal of Prohibition in 1934, Stevenson changed jobs. He became chief attorney for the Federal Alcohol Control Administration (FACA), a subsidiary of the AAA which regulated the activities of the alcohol industry. In 1935, Stevenson returned to Chicago to practice law. He became involved in civic activities. At the beginning of World War II, in 1939 and 1940, he was chairman of the Chicago branch of the Committee to Defend America by Aiding the Allies (known often as the White Committee, after its founder, William Allen White). During this same period, the Stevensons purchased a 70-acre tract of land on the Des Plaines River near Libertyville, Illinois, where they built a house. Although he spent comparatively little time at the Libertyville property, Stevenson considered the farm his home. In 1940, Colonel Frank Knox, newly appointed by President Franklin Delano Roosevelt as secretary of the Navy, offered Stevenson a position as principal attorney and special assistant. Stevenson wrote Knox's speeches, represented Secretary Knox and the Navy on committees, toured the various theaters of war, and handled many administrative duties. From December 1943 to January 1944, he participated in a special mission to Italy for the Foreign Economic Administration to report on the country's economy. A report Stevenson wrote following that mission was very well regarded. He was offered several jobs as a result. After Knox died in April 1944, Stevenson returned to Chicago and attempted to purchase Knox's controlling interest in the Chicago Daily News, but his syndicate was outbid by another party. In 1945, Stevenson accepted what he called a "temporary" position in the State Department. He was appointed special assistant to the secretary of state to work with assistant secretary of state Archibald MacLeish on a proposed world organization. Later that year, Stevenson went to London as deputy United States delegate to the Preparatory Commission of the United Nations Organization, a position he held until February 1946. When the head of the delegation fell ill, Stevenson assumed his role. Stevenson's work at the commission, and in particular his dealings with the representatives of the Soviet Union, resulted in appointments to the U.S. delegations to the United Nations in 1946 and 1947. In 1948, Stevenson entered the Illinois gubernatorial race as a Democrat. The November 1948 election was a landslide for the Democrats, and Republican incumbent Dwight H. Green was defeated. Principal among his achievements as Illinois governor were doubling the funding for public education, reorganizing the state police to disallow political appointments, cracking down on illegal gambling, and improving the state highways. Stevenson also vetoed the formation of a state anti-communist squad. He believed this squad would have been "more dangerous to ourselves that to our foes." And yet, he spoke frankly and forthrightly about communism, its dangers, shortcomings and the role it was playing on the world's stage. He was a popular public speaker, gaining a reputation as an intellectual, with a self-deprecating sense of humor to match. In 1949, Governor Stevenson appeared as a character witness in the first trial of Alger Hiss, a U.S. State Department official, involved in the formation of the United Nations who had been accused of spying for the Soviets. Early in 1952, while Stevenson was still governor of Illinois, President Harry S. Truman proposed that he seek the Democratic nomination for president. In a fashion that was to become his trademark, Stevenson first hesitated, arguing that he was committed to running for a second gubernatorial term. Despite his protests, the delegates drafted him. He accepted the nomination at the 1952 Democratic National Convention in Chicago. Following his acceptance speech the convention was so electrified, they rallied and cheered for a solid 30 minutes. Stevenson's distinctive intellectual speaking style endeared him to many Americans, while simultaneously alienating him from others. Stevenson's intelligence was the subject of much ridicule. During the 1952 campaign Republican vice presidential candidate Senator Richard M. Nixon of California labeled Stevenson an "egghead." In the 1952 presidential election against Dwight D. Eisenhower, Stevenson lost heavily outside the South. He won only nine states and lost the Electoral College vote 442 to 89. During the campaign, a photograph revealed a hole in the sole of his shoe. This became a well-known symbol of his frugality and earthiness. Following his defeat, Stevenson traveled throughout Asia, the Middle East and Europe, writing about his travels for Look magazine. Although he was not sent as an official emissary of the U.S. government, Stevenson's international reputation gave him access to many foreign officials. With Eisenhower headed for another landslide, few Democrats wanted the 1956 nomination. Although challenged by Tennessee Senator Estes Kefauver and New York Governor W. Averell Harriman, Stevenson campaigned more aggressively to secure the nomination. To Stevenson's dismay, former president Harry S. Truman endorsed Harriman, but the blow was softened by former first lady Eleanor Roosevelt's continued support. Stevenson won the nomination again at the 1956 Democratic National Convention in Chicago. His success was aided by strong support from younger delegates. These young delegates were said to form the core of the "New Politics" movement that supported legislation on civil rights as well as a softer stance toward Russia. Stevenson permitted the convention delegates to choose Senator Kefauver as his running mate, despite stiff competition from the junior senator from Massachusetts, John F. Kennedy. Following his nomination, Stevenson waged a vigorous presidential campaign, delivering three hundred speeches and traveling 55,000 miles. He called on the electorate to join him in a march to a "new America," based on a liberal agenda that anticipated the programs of the Kennedy and Lyndon B. Johnson administrations. His call for an end to aboveground nuclear weapons tests proved premature and lost him support. During the campaign, President Eisenhower suffered heart problems, which cast some doubt on his fitness for a second term. But the economy, which had been in recession, was enjoying robust health. Stevenson's hopes for victory were dashed in October when President Eisenhower's doctors gave him a clean bill of health. In addition, the Suez and Hungarian crises erupted simultaneously. The public became convinced that it was not the time for a change in leadership. Stevenson lost his second bid for the presidency, winning only 73 electoral votes in the 1956 presidential election. Early in 1957, he resumed law practice with associates W. Willard Wirtz, William Blair, Jr., and Newton N. Minow. He also accepted an appointment on the new Democratic Advisory Council, with other prominent Democrats. In addition, he was employed part-time by the Encyclopædia Britannica. Prior to the 1960 Democratic National Convention, Stevenson announced that he was not seeking the Democratic nomination for president, but would accept a draft. Because he still hoped to be a candidate, Stevenson refused to give the nominating address for relative newcomer John F. Kennedy, which strained relations between the two politicians. Once Kennedy won the nomination, Stevenson, always an enormously popular public speaker, campaigned actively for him. Due to his two presidential nominations and previous United Nations experience, Stevenson perceived himself an elder statesman and a natural choice for secretary of state, an opinion shared by few in the Kennedy camp. The prestigious post went to the little-known Dean Rusk. Stevenson was appointed U.S. ambassador to the United Nations. At the UN, he worked hard to support United States foreign policy, even when he personally disagreed with some of Kennedy's actions. His most famous moment came on October 25, 1962, during the Cuban Missile Crisis. Stevenson gave a presentation at an emergency session of the Security Council. He forcefully asked the Soviet Union representative, Valerian Zorin, if his country was installing missiles in Cuba, punctuated with the famous demand for an immediate answer, "Don't wait for the translation!" Following Zorin's refusal to answer the abrupt question, Stevenson retorted, "I am prepared to wait for my answer until Hell freezes over." In a diplomatic coup, Stevenson then showed photographs that proved the existence of missiles in Cuba, just after the Soviet ambassador had said they did not exist. Stevenson was assaulted by an anti-United Nations protester in Dallas, Texas, one month before the assassination of Kennedy in that same city on November 22, 1963. That assault contributed to the viewpoint that Dallas was filled with political right-wingers hostile to Kennedy. Stevenson died suddenly of heart failure on the afternoon of July 14, 1965 in London. Following memorial services in Washington, D.C., Springfield, Illinois and Bloomington, Illinois, Stevenson was interred in the family plot in Evergreen Cemetery, Bloomington, Illinois. The funeral in Bloomington's Unitarian Church was attended by many national figures, including President Lyndon B. Johnson, Vice President Hubert Humphrey, and Supreme Court Chief Justice Earl Warren. Stevenson's wit was legendary. During one of Stevenson's presidential campaigns, allegedly, a supporter told him that he was sure to "get the vote of every thinking man" in America, to which Stevenson is said to have replied, "Thank you, but I need a majority to win." The Central Illinois Regional Airport near Bloomington has a whimsical statue of Stevenson, sitting on a bench with his feet propped on his briefcase and his head in one hand, as if waiting for his flight. He is wearing the shoes that he famously displayed to reporters during one of his campaigns, a hole worn in the sole from all the miles he had walked in an effort to win the election. Dineed, Michael P. Man of Honor, Man of Peace: The Life and Words of Adlai Stevenson. NY: G.P. Putman and Sons, 1965. Greenberg, David. “Adlai Stevenson: Last of the Beautiful Losers.” Slate (June 30, 2000). Retrieved July 2, 2007. Harvard Square Library. “Adlai E. Stevenson: A Voice of Conscience.” Notable American Unitarians Series, Harvard Square Library. Retrieved July 2, 2007. Slaybaugh, Douglas. "Political Philosophy or Partisanship: a Dilemma in Adlai Stevenson's Published Writings, 1953-1956." Wisconsin Magazine of History 75(3): 163-194. ISSN 0043-6534. Stevenson, Adlai. The Papers of Adlai E. Stevenson (6 vols. ), 1972. This page was last modified on 1 February 2019, at 20:55.